Business units across Telford & Wrekin Council are employing ProcessFlows’ SMS technology to communicate several different types of information across the community. Stakeholder is one of those words that would have to be invented if it did not already exist. Without any notions of ownership or relationship or control, it is a catch-all term which describes the whole ‘community’ within and around an organisation. For a local authority, that stakeholder community is diverse; from its elected members and staff, through Council tax payers to service contractors selected for their ability to deliver value for money. And when the authority has responsibility for education, that network extends out to the teachers and the pupils and their parents. Communicating with these stakeholders effectively is a challenge for any authority. The vehicles available must reflect the diversity of the tasks. A forward-looking Council will gather round it a complete spectrum of communications, each chosen to give good value. There is no single communications medium that fits all applications, whether post, email, fax or public pages on the internet. No proven technology can be ignored, however, so long as it is cost-effective and safe and does not compromise the authority’s integrity. And that is how text messaging came to be adopted at Telford & Wrekin Council in Shropshire. Provided that a coherent system could be deployed to handle text messaging across the spectrum of applications being envisaged, the technology could clearly play a valuable role when the objective was to move small ‘parcels’ of information quickly to a known audience. After comparing the solutions available on the marketplace against the array of tasks for which the technology was intended, Telford & Wrekin opted for the ProcessFlows SMS gateway. The second Portfolio where SMS has been introduced is Children and Young People. 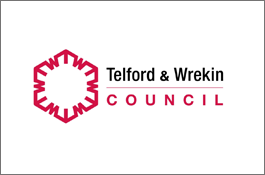 As a unitary authority, Telford & Wrekin Council retains a supervisory role over the state schools in its area. While schools now manage their own budgets and have a measure of operational independence from their local authority, the Council is ultimately responsible for the provision of school buildings and other capital resources. All thirteen of the secondary schools operated by the Council, along with the Family Information Service, are implementing the SMS system. Given the way that schools are now funded, and the fact that most new projects of this type have to be paid for out of their limited resources, the development team must surely be commended for a first class job ‘selling’ the service so successfully. One of the more obvious uses of the ProcessFlows Text Message solution is in helping to reduce unauthorised absences across the secondary sector by providing a ‘rapid response’ method of alerting parents and guardians that children have not reported into school. This application has two advantages over the traditional method of chasing up suspected truants. Once it is clear who are the non-attendees, a single message, but automatically personalised for each child, can be sent out from the SMS gateway. Apart from saving the time of a member of staff telephoning those responsible for the missing children, a significant reduction in telephone charges is possible.